I know that it might be hard to believe, but I have never been to London! I know... it is a shocker! Technically, I have been there, but it was purely to get a train to another city so it was a 5 minute adventure. Anyway... I am planning to change it and go for a massive shopping spree to London next year, but... after reading the article below about spending New Year's Eve in London, I might change my plans and go there sooner :) I hope you find the piece interesting. "New Year’s Eve in London is always a magical experience. The capital’s fireworks display is famous all around the world. Set at the foot of the London Eye, this 10 minute show is truly spectacular and something you won’t forget in a hurry. While you can experience it on TV, it’s definitely recommended you head to London to see it in person. The atmosphere and the entertainment cannot be matched on television; it just isn’t the same as hearing the fireworks and smelling the smoke afterwards. If you do plan on heading to London for New Year’s Eve, you’ll probably need plenty of spending money, so it can be a good idea to take along your Platinum Cashback Card. Every year, the EDF Energy London Eye display delights audiences throughout the country – although it’s actually watched worldwide. The show never disappoints and one reason why it’s so popular is because it manages to pack in an hours of fireworks in just 10 minutes. You can expect large crowds of people gathering around the River Thames as early as 9pm and as each zone closes as soon as it gets full, you will have to get there early. Pubs and restaurants surrounding the Thames will typically be ticketed on the night. It’s highly recommended you book as far in advance as you possibly can. One thing that is worth considering is watching the fireworks from the centre of London. If you can see the London eye, even in the distance, you’ll get to see the display. Staying just a little distance away can really save you a lot of money. No matter which part of London you head to on New Year’s Eve, there’s always something going on. Parties and special themed events in local bars will all be available. There’s also a New Year’s Day Parade to look forward to the day after. It’s recommended you use public transportation to get around the capital. It will actually be free all night so that’s one way to save a lot of money! Remember, using American Express card could also help you to spread the cost of the night if needed. 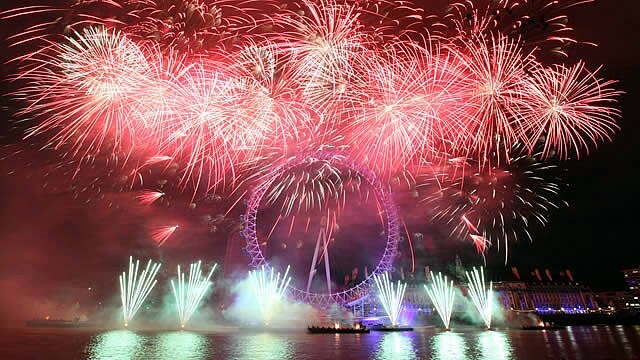 If you’ve got a lot of money to spare, you could even opt for a New Year’s Eve London cruise. As the clock strike midnight you’ll see the sky light up with fireworks. Whatever you plan on doing, book in advance and prepare for large crowds.